We denounce US secretary of state Kerry for slandering the Democratic People's Republic of Korea at an international forum and falsely accusing the DPRK of escalating tensions on the Korean peninsula. It is none other the US imperialists who have openly carried out exercises for invading the DPRK and for eliminating the supreme leadership of the DPRK through so-called "beheading operations ".The US imperialists have also shipped more military hardware into south Korea. Armistice Agreement.Kerry is ignorant of these facts. The US imperialist are clearly looking for excuses to justify the arms build-up in south Korea which is been carried out not only to overpower People's Korea but for the benefit of the giant US capitalist munitions monopolies such as Lockhead Martin.The US secretary of state is indulging a false blame game. It is the US that is responsible for the tensions on the Korean peninsula. more advanced versions of the Patriot missiles in south Korea. 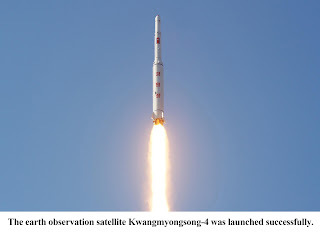 The spokesman of the DPRK NPCK was totally correct to say that " These are extremely dangerous military provocations as they further escalate the tension on the Korean peninsula and disturb the regional peace and security" indeed such moves only further destablise the situation on the Korean peninsula and are a further twist to the spiralling of tensions in Korea and the far east.The deployment of Patriot missiles to south Korea is a threat to world peace. there to make a pre-emptive strike on the DPRK much easier.Moreover why is a so-called "defensive " weapon deployed thousands of miles from the shores of the United States. Our organisations firmly support the call of the DPRK NPCK for a total and unconditional pullout of US forces from the south of Korea . The slogan "US out of Korea "must reverberate far and wide and must become the slogan of the peace movement in different lands. 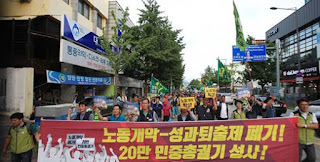 Hair-cut, street march, hunger strike, candlelight demonstrations, seminars, signature campaign, rallies and protest visit have been staged in south Korea by people of various circles including workers, peasants, youth and students as well as professors and religious men to protest against the deployment of THAAD. Hundreds of civic bodies have launched the actions against the deployment of THAAD and its scale is on the increase. The civic organization including the Solidarity for Peace and Unification said that the US and south Korean authorities plunged the south Koreans into a fear of war through the declaration of THAAD deployment and launched protest action. On July18, the national measure committee against deployment of THAAD held a press conference in front of the building of national assembly in which it asserted that if THAAD is deployed in south Korea, it would be reduced to an advanced base for safeguarding the US and Japan. The south Korean mass media including Kyunghyang Daily News, Hangyereh, Minjok Ilbo and CBS revealed the essence and possibility of danger of THAAD deployment and censured the authorities treacherous act. The opposition parties reproached the Park Geun-hye regime’s unilateral decision of the deployment of THAAD without public consensus. The residents of Songju County expressed their towering indignation at the authorities’ decision and turned out as one in the action against the deployment of THAAD. The Songju Committee for Checking THAAD Deployment involving inhabitants of Songju County, North Gyeongsang Province launched a protest action in Seoul on July 21 to urge the authorities to withdraw the decision of deployment of THAAD through tonsure and silence. They chanted slogans against the deployment of THAAD, holding placards written “Bad president, minister and premier”. The south Korean people’s stubborn actions against the deployment of THAAD deal a fatal blow at the treacherous Park Geun-hye regime. South Korean workers’ action against the south Korean authorities’ retrogressive labor reform is fiercer. The workers staged general strike at more than 250 worksites in 14 areas demanding the abrogation of anti-worker policy, stop to suppression of the KCTU, stop to restructuring sacrificing workers, wage-hike and ensuring of the rights of part-time workers, teachers and government employees. The KCTU held a rally for the general strike with attendance of over 11 000 workers in Seoul. The acting chairman of the KCTU said that the government and capitalists branded the general strike as an illegal and egoistic and asked back that who take an illegal act and drive the part-timers to death. The business groups are discharging the workers by enforcing the labor restructuring and suppressing righteous trade unions activities, and neglecting to take appropriate measures when the part-timers are killed or wounded by accident, he noted. The chairman of trade unions of public transportation warned that unless the piecework system aiming at mass dismissal is withdrawn until September 27, the workers of the key industries and public sectors would launch an indefinite general strike. They went to the building of the national assembly to hold another rally. They poured out their hearts that a high-ranking public official defiled the popular masses as dog and pig. They branded the high-ranking bureaucrats of the "government" and the police, servants of the power, as dogs barking at their owners and the plutocrats as pigs as they betray even the people to meet their interests. The righteous action of south Korean workers, who want to lead a life worthy of man, would keep a vigorous progress. South Korean people’s dissatisfaction with the Cheongwadae and the ruling Saenuri Party is growing in intensity as the Cheongwadae and the ruling Saenuri Party’s recent scandals are laid bare in a row. The Saenuri Party’s former head and his members in charge of information committed scandals when they launched propaganda for the last parliamentary election. In this connection, a spokesman of the emergency measure committee of the Saenuri Party shifted all the responsibility for the scandal on to those suspected to divert elsewhere public criticism. In recent, a transcribed telephone was opened to the public that the leading figures of the Saenuri Party forced a candidate to change his constituency in order to field pro-Park candidate. In this regard, the opposition parties as well as within the ruling party asserted that the investigation committee should be formed to hold legal responsibility for it. Woo Byong-woo, a civilian secretary of Cheongwadae, is under sharp criticism of the opposition parties and mass media as he was involved in a deal of additional real estate scandal and illegal designation of the director of the Prosecutors Office. The Park Geun-hye regime and the Saenuri Party are a cesspool of corruption and their companies are a cluster of treachery. The south Korean people turned their backs to the south Korean ruling quarters which seek a gay life and lust for power in disregard of people’s livelihood. Pyongyang, July 28 (KCNA) -- After deciding to deploy THAAD in south Korea, the U.S. recently transferred a battery of PAC-3 to the base of U.S. imperialist aggressor forces in Kunsan, North Jolla Province of south Korea from the U.S. Air Force's Kadena base, Okinawa. Earlier, the U.S. decided to deploy on a permanent basis nuclear-powered submarine Mississippi and super-large nuclear-powered Ohio, which had entered Pusan Port, in the waters surrounding the Korean peninsula. The U.S. is blustering that it would additionally deploy improved PAC-3 MSE, whose maximum altitude is twice that of PAC-3 now deployed in the U.S. imperialist aggressor forces present in south Korea. These are extremely dangerous military provocations as they further escalate the tension on the Korean peninsula and disturb the regional peace and security. To force the U.S. imperialist aggressor troops to pull out of south Korea is the basic way of foiling the U.S. frantic armed buildup for a nuclear war and preventing a nuclear war disaster on the peninsula. The U.S. troops in south Korea are like a time bomb planted in the powder keg for a nuclear war and the withdrawal of the U.S. troops is the most urgent matter which brooks no further delay. The struggle to defuse the danger of a nuclear war on the peninsula and guarantee the regional peace and security should start from pulling the U.S. troops out of south Korea. The DPRK, which joined the front rank of nuclear powers, is now fully ready to cope with all forms of wars to be ignited by the U.S. imperialists, and the U.S. troops in south Korea will be the primary target of our merciless deadly strike. The U.S. should properly face up to the strategic position of the DPRK and the trend of the times and behave itself and pull the aggressor forces and war equipment out of south Korea without delay. U.S. Secretary of State Kerry spouted out foolish remarks that the U.S. has no hostile intent against north Korea at the ministerial meeting of the ASEAN Regional Forum on July 26. Why is the U.S. resorting to reckless saber-rattling, openly vociferating about "beheading operation" and "occupation of Pyongyang" after introducing all kinds of strategic assets into south Korea if it has no hostile intent against the DPRK? The successive U.S. presidents personally made public appearances and openly included the DPRK, a dignified sovereign state, on the list of preemptive nuclear attack while terming it "part of an axis of evil" and "a country that has to be removed" and cried out for "collapse of system." How can this be understood? Kerry asserted the joint military exercises have never posed problems and the DPRK-U.S. Agreed Framework was concluded with joint military exercises going on. This is sophism enough to make even a cat laugh. As he holds the post of the U.S. Secretary of State, he should know the historical facts that once joint military exercises were suspended after the U.S. complied with the demand of the DPRK for it and that those exercises have been one of major causes that made the hard-won DPRK-U.S. agreements go bust. The U.S. joint military exercises on the Korean peninsula are not attributable to the DPRK's access to nukes but because the U.S. steadily increased nuclear threats while ceaselessly holding war exercises for aggression, the DPRK was compelled to opt for having access to nuclear deterrence and bolster it up. The true aim sought by the U.S. is to shift the blame for the tension on the Korean peninsula on to the DPRK, secure a pretext for its arms buildup and joint military exercises pursuant to its rebalancing strategy in Asia-Pacific for aggression, and dodge the neighboring countries' protest and criticism of its decision to deploy THAAD in south Korea as an immediate task. No one can predict what situation the U.S. reckless arms buildup and the upcoming August joint military exercises will create on the Korean peninsula and in its vicinity. always emerged victorious in a showdown with the U.S.
Kim Il Sung, the invincible and iron-willed commander. One of them was a combat to liberate Taejon, which has been known as a model of modern siege warfare. People's Army shattered the myth of the U.S. imperialists' "mightiness". Pyongyang, July 28 (KCNA) -- The director general of the Department of U.S. Affairs of the Foreign Ministry of the DPRK Thursday was interviewed by the chief of AP Pyongyang Bureau on a visit to the DPRK on the recent situation on the Korean peninsula. Answering the question as to the situation prevailing on the Korean Peninsula, the director general clarified that it is the DPRK's just right to take the toughest counteraction against the U.S. as it went beyond the "red line" in the standoff with the DPRK and declared a war against the DPRK by daring hurt the dignity of the supreme leadership of the DPRK. The U.S. recent moves such as ceaseless introduction of strategic assets to the vicinity of the Korean peninsula and decision to deploy THAAD in south Korea hint that it will stage unprecedented maneuvers during the joint military drill to be held in August, he said, clarifying that if an undesirable event occurs on the peninsula during the joint military drill, the U.S. would be held wholly responsible for it and that the DPRK is fully ready for any physical steps. He stressed that the DPRK will continue to take the tough counteraction against the U.S. unless it rolls back its hostile policy towards the DPRK aiming at "bringing down its social system." Greetings to all Songun idea followers and Juche Idea followers on the occasion of the 63rd anniversary of the victory of the Korean people led by the great leader Generalissimo KIM IL SUNG in the great Fatherland Liberation War against the US imperialist aggressors . Thanks to the Songun-based art of command and superb Juche-based military tactics of the great leader generalissimo KIM IL SUNG , the Korean people won a great victory, fair and square , against the US imperialists , the chieftain of world reaction and the biggest exploiter and oppressor of the people. The US imperialists suffered an enormous defeat .They lost huge numbers of troops as well as equipment and materials that was greater than many of the wars that the US imperialists had fought .The defeat of the US imperialists in the Fatherland Liberation War started off a new era of anti-US,anti-imperialist struggle sealing the doom of US imperialism. The great leader generalissimo KIM IL SUNG by leading the Korean people to victory in the Fatherland Liberation War against the US imperialists safeguarded the socialist camp and made a great contribution to the world revolutionary movement. Today the DPRK led by the dear , respected and great leader Chairman KIM JONG UN is incomparably stronger than in the 1950s and has nuclear weapons . 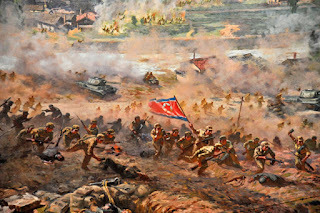 Should the US imperialists be idiotic enough as to provoke another Korean war we are sure that the DPRK and KPA will defeat the US imperialists and reunify the country and that the flag of the DPRK will again fly high over a liberated Seoul. Pyongyang, July 27 (KCNA) -- The Park Geun Hye group of south Korea, being ignorant of where it is standing, is busy with hectic diplomacy over THAAD deployment only to draw derision and criticism of the public at home and abroad. As known, Northeast Asia is a very sensitive region where interests of world major powers are intermingled complicatedly. Attention of the world public has been focused on the region where a scramble for power among big powers is getting fierce. Specifically, the danger of a new fresh Cold War is looming on the Korean peninsula and in other parts of Northeast Asia and a nerve war and conflicts between the U.S. and big regional powers are festering in the wake of the recent decision of U.S. THAAD deployment in south Korea only to turn it into a frontline base of the U.S. for realizing its strategy for dominating Asia-Pacific and an advanced base for igniting a nuclear war. Against this backdrop, the Park group has gone so foolish as to get involved in the power scramble of the neighboring big powers, talking about "shuttle diplomacy" on "pro-north countries," only to remind one of a shrimp getting its back broken in a fight between whales. The south Korean regime has bluffed as if it would do something significant in Northeast Asia plagued with a hot scramble of power, going here and there with such petty diplomatic signboards as "plan for building new Eurasia", "idea of achieving peace in Northeast Asia" and "self-sacrificing diplomacy." Terming the DPRK's bolstering of military muscle with the nuclear deterrent as its pivot a "provocation" and "threat", the chief executive-led south Korean authorities have all turned out in conducting "diplomacy for soliciting pressure on the north" in league with outsiders. When the U.S. and other "allies" found it impossible to materialize their criminal purpose through "sanctions" only, the puppet regime recklessly opted for "intensive diplomacy to win over the countries friendly to the north or sympathizing with it through pressure." Chief Executive Park at a recent ASEM summit solicited international support for her policy of confrontation with the DPRK, calling for "leading the north to a right change", "execution of sanctions steps" and "international efforts for cooperation over north's nuclear issue." Traitor Park during her 20 odd foreign junkets desperately worked to solicit worldwide cooperation for escalating confrontation with the DPRK, loudly talking about "strategic partner" and "international cooperation". However, no one has regarded her group as partner for "diplomatic cooperation" but as colonial lackeys of the U.S. and a herd of rabid dogs desperate in biting the fellow countrymen. It is quite natural that the Park group of traitors and sycophants without an iota of national self-esteem has suffered shame and humiliation while going here and there like a hungry dog to hurt the compatriots. South Korea, which turned into a complete colony of the U.S. due to the Park group's treacherous policy of depending on outsiders, is reminiscent of Korea dating back to late 19th century to early 20th century when the country was ruined as a theatre of the scramble among big powers. The on-going diplomatic crisis facing the group is an inevitable lot of those who have prolonged their remaining days by treachery and reliance on outsiders without any correct political philosophy and sovereignty. Pyongyang, July 26 (KCNA) -- On July 12 the U.S. under secretary of Treasury officially admitted and opened to public the fact that international criminal bodies have concealed and laundered illegal funds through bogus companies operating in the U.S. The under secretary said that the results of tracking terrorist, drug-smuggling and computer hacking organizations overseas proved all the criminal bodies are closely linked with bogus companies in the U.S., adding bogus companies are appearing one after another and criminal organizations are making use of them as many states of the U.S. are allowing the establishment of anonymous companies hard to confirm the identities of their owners. The U.S. government organs, in particular, are overtly ensuring the activities of the bogus companies for concealing and laundering the funds, the under secretary said, deploring that U.S. Congress is refusing to adopt a bill on combating illegal dealing, being involved in bribe operations of backstage negotiators. This goes to prove that the U.S. is the arch criminal fostering the money-laundering of terrorist organizations and committing state-sponsored terrorism, threatening the international financial system. Illegal fund dealing serves as a chronic illness in the capitalist society of the U.S. where the competition for existence based on the jungle law is justified and all crimes are rife and it becomes a major lever for existence in the U.S. The U.S. criminal organizations are raking up a huge amount of illegal funds by use of diverse levers such as fraud and swindle, robbery, prostitution, drug and arms smuggling, flesh traffic and counterfeit security dealing. They are keeping U.S. economy afloat by investing them in it and laundering illegal money. Lurking behind many states' allowance of anonymous companies is the purpose of reenergizing the illegal fund dealing and drastically increasing tax income through them. More than a million companies are registered in Delaware State with less than a million-population as it is ill-famed for such companies and 880 million U.S. dollars or 23 percent of the state government total budget were collected from the above-said companies as taxes in 2013 only. This indicates that the U.S. is mulling making up for the exorbitant fiscal deficit caused by the indiscreet operation of war economy through the circulation of illegal funds. The U.S. is the world's worst criminal state making no scruple of despicable practices in financial dealing to meet its interests though it is censured and condemned by the international community. The said bogus companies in the American empire and their illegal financial activities are paving the way even for international criminal organizations to escalate their crimes. The U.S. imperialists and the south Korean puppet military warmongers have massively increased their armed forces in the vicinity of the five islands in the West Sea of Korea and making adventurous military provocations against the maritime guard line of the KPA. 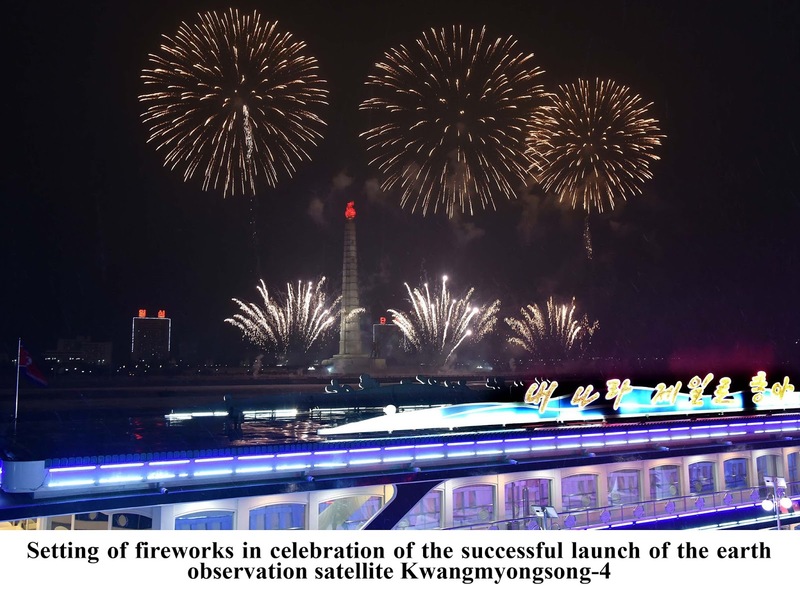 They have also carried out provocatons such as infiltrating speedboats and warships intot the territorial waters of the DPRK . They are also permanently deploying 2 commando teams. The West Sea of Korea is known internationally as a hotspot and an area of extreme tension . This is entirely due to the provocations of the US imperialists and south Korean puppet fascist warmongers and their insistence on the bogus and unrecognised "northern limit line". It is extremely foolhardy for the US imperialists and south Korean puppets to carry out provocative actions in the area of the West Sea. We urge the US and south Korea to heed the warning of the West Sea fleet of the KPA and desist from acts of provocation and increasing tension in the West Sea. Very soon it will be the 63rd anniversary of the victory of the Korean people ,led by the great leader generalissimo Kim Il Sung , against the US imperialists . 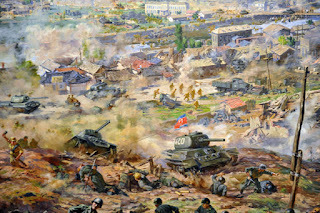 As the DPRK Foreign Ministry Statement points out ; " The DPRK, who won a victory in the confrontation of rifles and A bombs in the war ignited by the U.S. in the1950s thanks to the Juche-based war methods and leadership of President Kim Il Sung, has registered a series of victories in an all-out stand-off with the U.S., demonstrating its might as an invincible nuclear power, a power with elite army, under the Songun guidance of leader Kim Jong Il and Marshal Kim Jong Un." Indeed the heroic and glorious KPA commanded by the great leader Marshal Kim Il Sung tore the guts out of US imperialism.The US imperialists lost over : 1,567,128 men including 405,498 US soldiers, 1,130,965 south Korean puppet troops, and 30,665 soldiers of their satellite states were killed, wounded or captured; 12,224 airplanes includ­ing "air fortress B-29" were downed, damaged or captured, 7,695 guns, 3,255 233 tanks and armoured cars were lost; and 564 warships and vessels including the heavy cruiser Baltimore and the flagship of the Seventh Fleet Missouri were sunk or damaged. The loss suffered by the US imperialists was nearly 2.3 times greater than what they had suffered in the four years of the Pacific War during World War II. Even official US statistics showed during each of the three years of the Korean war they lost double the troops for each year of the Vietnam war. US general Mark Clark lamented mournfully that he was the first US commander to conclude an armistice without a victor. Yet the US imperialist appear to be oblivous to the lessons of their defeat in the past Korean war. Instead they are persisting with an arms build-up and are deploying THAAD in south Korea . Worse still they plan to conduct Ulji Freedom Guardian in August. The DPRK today is not the DPRK of the 1950s . The DPRK is now an independent nuclear power and has ICBMs and SLBMs. It can destroy the US if it starts a war .In the event of a second Korean war the US imperialists would be powerless to stop the Korean People's Army of the DPRK overunning south Korea thus liberating south Korea from US imperialist rule and reunifying Korea. dear respected Marshal Kim Jong Un ! The U.S. imperialists and the south Korean puppet military warmongers are these days massively increasing armed forces in the vicinity of the five islands in the West Sea and making adventurous military provocations against the maritime guard line of the KPA. The south Korean military decided to permanently deploy two commando teams of the puppet army on the Yonphyong Island and is massively increasing naval forces including warships. Recently the south Korean military hurled spying means including drones into the air above the vicinity of five islands of the West Sea of Korea to spy the area of the KPA. The south Korean Navy let speedboats and guard ships intrude into the waters of the north side under the pretext of controlling Chinese ships' illegal fishing. Timed to coincide with this, brass hats of the south Korean army went to the forefront area of the West Sea to examine the readiness for coping with the possible "provocation" by the north. The south Korean military warmongers went the lengths of staging the farce of "creating fish-breeding reef". The "fish-breeding reef", structure weighing dozens of tones, is being set up in the sensitive waters which witnessed three skirmishes in the past, a fact clearly showing the provocative nature. Such military provocations escalating in the world's biggest hotspot waters are a revelation of the sinister intention to spark off a military conflict in the said waters and defend the illegal and brigandish "northern limit line" at any cost. The gravity of the developments has been augmented as the reckless moves of the puppet military warmongers are being perpetrated at the U.S. active instigation. The U.S. imperialist aggressor forces appeared at the Military Demarcation Line in Panmunjom at around 2:45 on Sunday to inform the "creation of fish breeding reef" over loudspeaker. The U.S. went so ridiculous as to use the phrase "south of the northern limit line" when describing the site of creation, revealing its foolish attempt to give impression that the illegal and ghost line is the extension of the military demarcation line in waters of the West Sea of Korea. The KPA is clearly seeing through the enemies' scheme for military provocation. 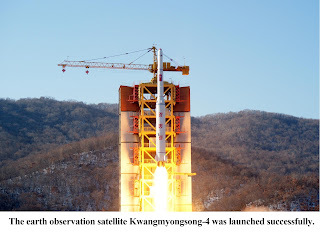 It is the black-hearted intention of the aggressors and provokers to perpetrate a military provocation in the sensitive waters in a bid to induce the KPA into self-defensive counteraction and describe it as "provocation" and "threat." The U.S. and the south Korean puppet forces had better behave themselves if they do not want to meet a dog's death in the waters. Kim Il Sung, has registered a series of victories in an all-out stand-off with the U.S., demonstrating its might as an invincible nuclear power, a power with elite army, under the Songun guidance of leader Kim Jong Il and Marshal Kim Jong Un. Much water has flown under the bridge since the hard-fought war in the 1950s but the U.S. remains unchanged in its wild ambition to invade the DPRK. The U.S. has persisted in its arms buildup, war drills and military provocations on the Korean peninsula, seized with its invariable scenario to stifle the DPRK and dominate Asia and the world, far from drawing a lesson from the serious political and military defeats it sustained in the past Korean war. It dared hurt the dignity of the supreme leadership of the DPRK, not content with escalating harsh sanctions and pressure upon it while massively introducing various strategic nuclear strike means and latest war hardware into south Korea. While stepping up the moves to deploy THAAD, the U.S. is busy staging ever more undisguised war drills. Despite the international community's concern and denunciation of the its saber-rattling pushing the situation on the Korean peninsula to the brink of a war, the U.S. is mulling staging Ulji Freedom Guardian joint military drills targeting the DPRK in August in league with the south Korean puppet forces. "unsinkable aircraft carrier " . THAAD means that the south Korean people and Korean nation as a whole are exposed to the danger of a nuclear holocaust . all kinds of excellent protest actions including direct action. We support the struggle of the Korean people north and south agains the US moves to ignite a nuclear war . US bases in south Korea must be dismantled and weapons withdrawn. 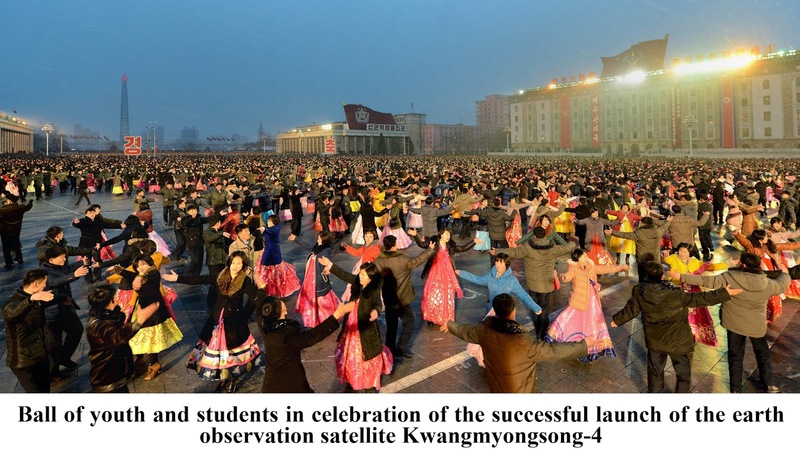 Do not believe the latest rubbish from the imperialist media about the DPRK . Some silly fools are saying that the DPRK economy has contracted . This is rubbish . In fact the DPRK economy is one of the fatest growing economies in the whole world ! . I visited the DPRK in October and went back in April 2016 and within those 6 months many new buildings had sprung up and the construction of Ryomyong Street had started . 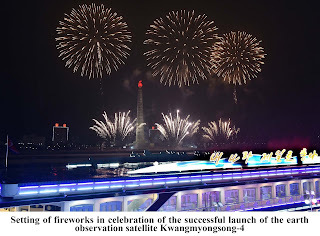 Moreover the DPRK's growth is not only fast but it is self-sustaining as it is based on domestic resources ! n article titled "Insight into truth about foul 'art of self-protection' peculiar to bete noire Park Geun Hye." Hunger strike, writing in blood, hair-cut and candlelight demonstrations have been staged in south Korea by people of political, academic, social, financial and other circles to protest against the deployment of THAAD. Under this situation Park Geun Hye set out on foreign junkets after she gave an instruction to "put a stop to unnecessary controversy over THAAD deployment at once." She has so far made foreign trips 24 times to escape public criticism and maintain her office, detested by the world people. So, it is needed to dig up the truth of Park's foul "art of self-protection" that serves as a means of existence peculiar to her. The first expression of such peculiar "art" can be found in her runaway trip whenever she faced ruling crisis. It was well evidenced by the fact that she flew overseas at night in 2013 when a case of the Intelligence Service's involvement in the "presidential" elections was disclosed to endanger her hard-won "presidency". When the worst ferry Sewol disaster occurred, burying many school boys and girls at sea, Park hastily ran away from south Korea for fear of the people's growing protest against her total indifference, instead of taking even elementary rescue measure. It is also the wicked hostess of Chongwadae that made a foreign trip, making such invectives as rubbing salt into the wounds of the bereaved families who were worried about bodies of their children, unable to retrieve even bodies in one year. Park also fled to Canada in September of 2014 when she was deluged with a flurry of criticism over the "case of beating a soldier to death" that happened in the puppet army contaminated by the mammonism-based jungle law and Yankee-style misanthropy. In April of 2015 when the south Korean people were infuriated over the "case of Song Wan Jong's suicide" related to the scandals of Chongwadae, she sneaked into Kimpho Airport after urging a "strict investigation". In October and November of 2015 when the situation of south Korea turned unfavorable to her "yusin" dictatorship and the "introduction of state-compiled textbooks" aimed at confrontation with fellow countrymen in the north, she set out on a overseas tour allegedly to attend an international meeting and toured several countries for 12 days in a bid to escape an anti-"government" protest involving hundreds of thousands of people. It is by no means accidental that she took the flight for a foreign tour the next day after the site for the deployment of THAAD was announced. Her "self-protective" attitude can be found in evading her responsibilities for all sorts of social irregularities in south Korea. Since she came to power, various power-backed scandals have occurred but each time she cunningly dodged her responsibilities for them. She would, at first, make a great fuss, crying out for "strict investigation and harsh punishment" like a thief crying "Stop the thief!" but shelved the matter or imposed penalties on a few subordinates after some time passed and public criticism subsided. As far as the ferry Sewol disaster is concerned, Park accused the Maritime Police Agency of neglecting its mission and the Ministry of Security and Administration of failing to play its role and yelled at the Ministry of Oceans and Fisheries to take full responsibility for the disaster but, in the end, passed the buck to others, saying that the captain, crewmen and the shipping company should be held accountable for it. She was brazen-faced even when the truth was open to public that the puppet authorities were responsible for the disaster as the ferry was overloaded with the building materials for a naval base on Jeju Island, the main cause of the disaster. Then, what is lurking behind the evasion of responsibility, one of her "art of self-protection"? It is none other than the mode of existence of a "yusin" dictator who mercilessly victimized her closest aides to prolong her despicable remaining days. Her "self-protective" attitude can also be found in her frantic confrontation with the fellow countrymen she resorts to whenever she faces ruling crises. As she had an unusual experience of reversing the unfavorable situation by raising clamor about "followers of the north" as a heart stimulant in the run-up to the "presidential" elections in 2012, she accustomed herself to use the method every time she found herself in a ruling crisis. It is quite natural that the public pays attention to the fact that all rumors about "the north's deeds" during her past three and half years' office came up whenever her ruling crisis reached an extreme phase. Then, why does she get so frantic with the confrontation with the compatriots, putting even the successive rulers into the shade? It is because plot-breeding, slander, hostility and confrontation targeting the fellow countrymen are the best "art of self-protection" that ensures her stay in power. Her dirty "art of self-protection," characterized by habitual runaway trips, shameless evasion of responsibility and heinous confrontation with the fellow countrymen, is a legacy of "yusin" shaped by the former dictator who met a miserable death. Due to her "art of self-protection" aimed at prolonging her remaining days, south Korea plunges deeper into a colony of the U.S. and a tundra of human rights and a theatre of immorality and evils. Her "art of self-protection" can no longer work on anybody. The south Korean warlike force launched marine joint exercise together with the US troops in Pohang, North Gyengsang Province from June 27 to July 14. Involved in the war rehearsal are 800-strong task force of the south Korean marine corps, 500-strong U.S. marines from Okinawa, Japan, artillery pieces, tanks, armored vehicles, transport and attack helicopters and many other attack weapons. 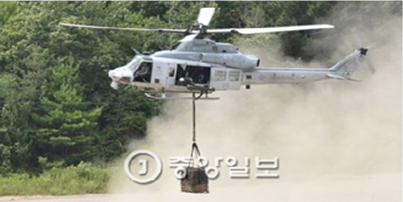 The drill was staged in which the south Korean and the US marines attack core facilities deep inside the rear of the DPRK through landing operation under the fire support of fighters, helicopters and guns. The south Korean military prattled that it was a joint exercise involved in all branches of army and striking capability. 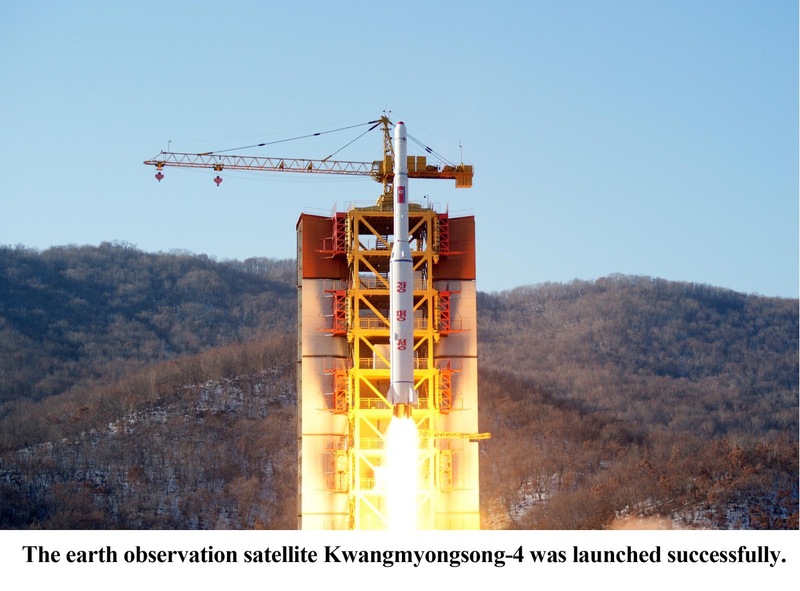 The Ssangyong war game conducted in Pohang as part of Key Resolve and Foal Eagle 16 in last March was the unprecedented, worst military provocation against north Korea in scope of scale, content and performance. Their risky military maneuvers are clear evidence that the north-targeted war moves of the belligerent forces at home and abroad reach a very dangerous phase in defiance of north Korea’s peaceful approach. Frequent military war games and deployment of THAAD should be cancelled as they are pushing the situation on the Korean Peninsula to the brink of war and threatening peace and security of the Northeast Asia. Progressive organizations of people from all walks of life in south Korea including the Bar Association for Democratic Society and the office of the UN high commissioner for Human Rights asked for interviews with the abductees of the DPRK, but the puppet regime turned it down under the pretext of "personal safety " of the families of the victims. Meanwhile, the puppet regime let human scum talk such nonsense that if the "women, who voluntarily defected from the north," are opened to public, their families in the north would be in danger. 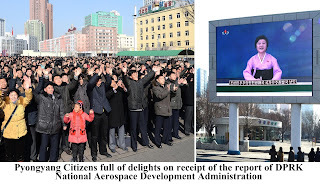 What the regime claimed is nothing but sheer sophism to prevent the disclosure of the truth about its thrice-cursed group allurement and abduction of women of the DPRK. At the families' earnest request, we repeatedly demanded the south Korean puppet authorities allow their families to go to Seoul via Panmunjom to have face-to-face meeting with their children. The families are now repeatedly calling on the south Korean puppet regime to allow them to meet their children, greatly angered by its continued detention of their children under the pretext of "group defection according to their free will." This notwithstanding, the puppet group is vocal about "personal safety" of the families of the abductees. 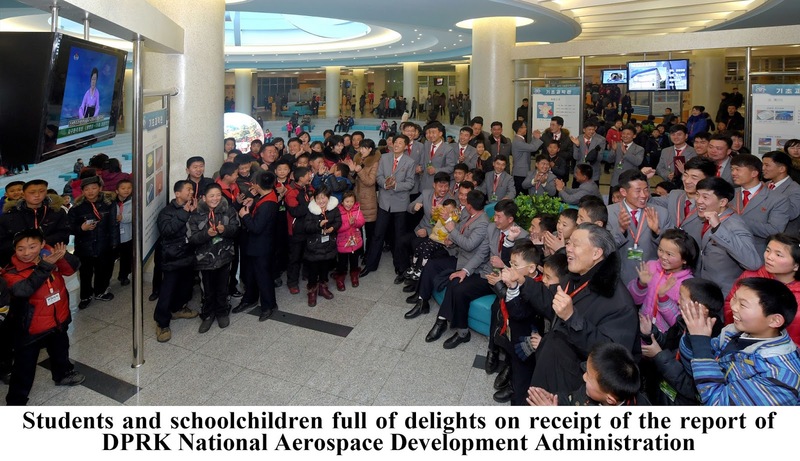 This is an intolerable insult to them and cheap propaganda aimed to tarnish the image of the dignified DPRK. If the puppet forces did not abducted citizens of the DPRK, why do they refuse to make public the fate of the abductees and meet the request for informal interview with them made by international human rights organizations even today after the lapse of three months since they were taken to south Korea? 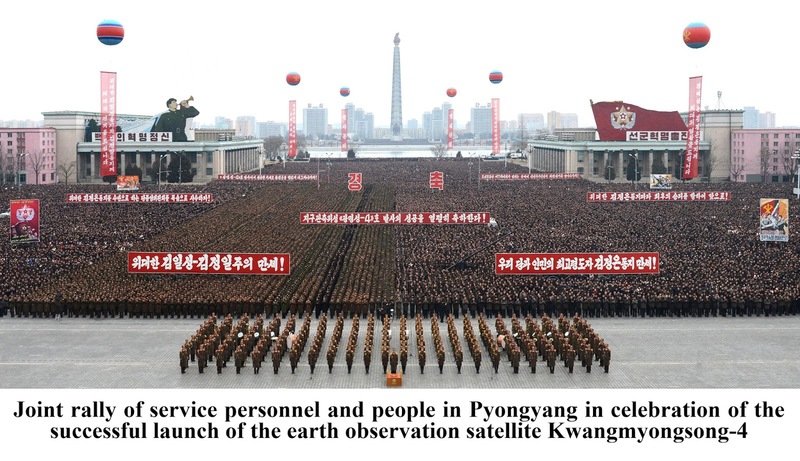 As clearly disclosed through the press conference with a stooge of the puppet Intelligence Service who was recently spotted and arrested in the DPRK, the puppet group has gone frantic in its smear campaign against the DPRK while appeasing and deceiving citizens of the DPRK and alluring and abducting them to south Korea and then misleading the public opinion by describing it as "voluntary defection from the north". The puppet group is resorting to sleight of hand such as "personal safety" of families of abductees in a bid to justify its vicious act of putting them in custody and keeping them away from contact with outside. But it can never cover up its true colors as a group of international terrorists and human rights abusers. Absolutely unpardonable is the hideous unethical and treacherous crime of the puppet group that is forcing their children to be separated from their parents against their will and seeking to make them fall victim to the farce of confrontation with fellow countrymen in the north. 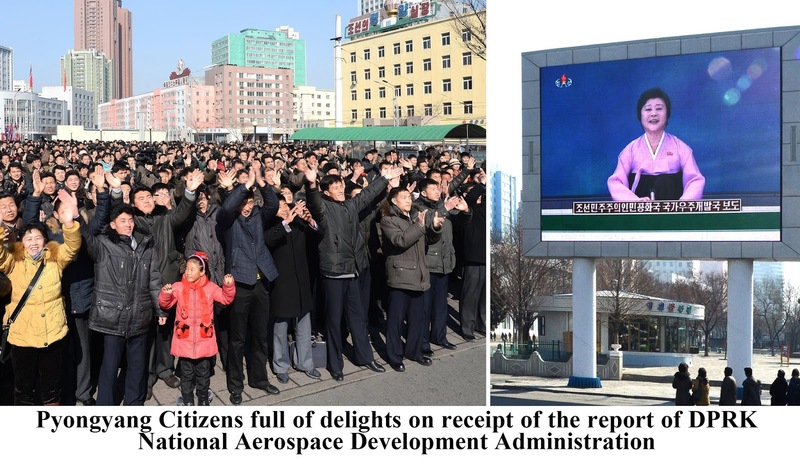 The puppet group has to immediately stop the unbearable mental and physical persecution of the woman citizens of the DPRK and cruel "defection operation" and send them back to the embrace of the DPRK unconditionally. Pyongyang, July 22 (KCNA) -- All Koreans in the north, the south and abroad should never tolerate the traitor Park Geun Hye regime's criminal moves to deploy THAAD but turn out as one in the nation-wide struggle to resolutely check and foil them, said a spokesman for the National Peace Committee of Korea in a statement on Friday. This is an eruption of unbearable hatred and resentment of the public at the Park regime which makes no scruple of leaving the territory of the Korean nation and all its members to tender mercy of the U.S. imperialists keen to ignite a nuclear war and brings a new Cold War to Northeast Asia, hell-bent on confrontation with fellow countrymen in the north and sycophancy toward the U.S. and treachery. Branding the Park regime's sycophancy to the U.S. as an unpardonable act of sycophancy and treachery, the National Peace Committee of Korea vehemently denounces this in the name of all Koreans. Owing to the Park group's foolish decision to deploy THAAD, south Korea is now being reduced to the U.S. nuclear outpost for aggression and a hotbed of a nuclear war and the danger of a nuclear war on the Korean peninsula and in Northeast Asia is looming as potential one. Traitor Park Geun Hye is making desperate efforts to escape ruin in return for leaving the interests of the nation to the tender mercy of her U.S. master and realize her wild ambition for escalating the confrontation with the fellow countrymen in the north but she is bound to meet the final doom as she is adding to the indelible crimes committed against the nation. Park would be well advised to properly know that she is sadly mistaken if she calculates she can escape the just strike of the DPRK even a bit through the deployment of THAAD. On this opportunity, we extend positive support and firm solidarity to the south Korean people in their just struggle for defusing the danger of a nuclear war on the Korean peninsula, having the U.S. imperialists' aggressive and murderous weapons and bases dismantled and ensuring peace and stability in Northeast Asia. At a time when People's Korea, a small sovereign state,whilst experiencing the most severe sanctions, conquers new frontiers in the construction of people's happiness, a scathing press conference was held in Moscow, with the participation of the foreign Ministers of Russia and South Korea. Sergei Lavrov said that Russia will not accept the self-proclaimed North Korea's nuclear status, he also noted that Russia from its part will make everything to push the DPRK on the path of denuclearization, which sounds like a threat. Perhaps he hinted at the fact that Russia wouldn't mind to sign some more sanctions against the DPRK. Yun Byung-se(sk foreign minister), in his turn, noted that the DPRK's nuclear programme, is perhaps the most acute problem, and that it is an obstacle in establishing peace in the region. He said that the nuclear aspirations of the DPRK doing a rollback in inter-Korean relations, and create problems in cooperation with Russia on the lines of the Asia-Pacific region. Well, what can we say? Treacherous circles in the Russian leadership are clearly not interested in the military-political and strategic cooperation that is so necessary in such a difficult time for Russia, but only in the economic relations, plus with a relationship of trust to a pro - American state - South Korea. Here it is worth mentioning the words of Sergey Lavrov, where he noted the importance of the participation of the South Korean side in the Arctic development and cooperation in information security. Pursued by the treacherous policy circles rests on flirting with all forces in pursuit of their own economic interests that are, in fact opposed to the strategic interests of the Russian state. A similar situation can be observed in the middle East with Israel as a den of Zionism and imperialism with nuclear weapons, on which Russian authorities prefer to remain silent. It is very disgusting that in this difficult year, the Russian foreign Ministry and state television, have never reported a large-scale military manoeuvres of U.S. and South Korea, in which about 300 000 puppet troops and ~30,000 American troops took part. By the way, I must say that recently on the TV channel "Russia -24" there was a hysteria about NATO on the borders with Russia. It was about a critical number of troops in the amount of 20-30 thousand, which leads to see the complete hypocrisy towards North Korea! It is necessary to take into account the fact that the United States each year conduct near the borders of North Korea large-scale military exercises Key Resolve and Foal Eagle, which as usual was held in spring. Despite this, the Russian foreign Ministry with the support of the media trying to link the fact of certain "violations" of UN resolutions and conducting annual exercises, adding for a desert "a violation of the UN Convention on the non-proliferation of nuclear weapons", which in its essence is a blatant imperialist occupation Convention intended, judging by the real work of the UN, aimed not to protect the world from nuclear disaster, but to erase from the Earth small sovereign states with their national happiness! 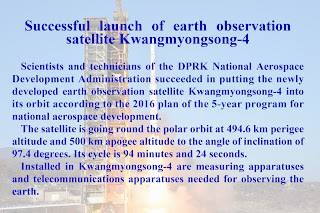 If we look at the reports about the situation on the Korean Peninsula from March to April, what is clearly visible, is the libellous propaganda line, originating from throwing dirt at peaceful exploration of outer space – something that is not forbidden to any sovereign state! It is worth noting that people who call themselves "experts", but in fact are political prostitutes, called the launching of the satellite "test of a ballistic missile". The test of a ballistic missile can be rightly called only the test, which is also testing the atmospheric re-entry of the warhead, with the subsequent hit/miss/ in a given square at a designated distance. 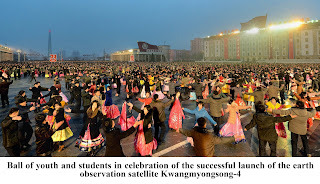 In fact, American imperialism, stimulated by the unwillingness of a genuinely sovereign state to raise his hands up, uses the fact of measures for the defence of Korea as a pretext to deploy more armed forces on the peninsula, with even more aggressive policy, blatantly distorting in the media the desire to pursue an independent policy as "aggressive behaviour that threaten the region and the world at large". For example, what has never been reported in the Russian media, is that these exercise involved about 330 thousand soldiers, with all kinds of weapons, including nuclear, as well as working out a plan for preventive the elimination of the Supreme leadership of the DPRK, which is unprecedented. There is no limit to the indignation of the progressive people all over the world! With all this, the position of the bourgeois circles in Russia is almost the same as the position of the US state Department, which is trying to pass on to the DPRK the responsibility for the escalation of tensions on the Korean Peninsula, citing "the North Korean nuclear threat", which in most reality is a program to curb these greedy flesh-and-blood predators like US, and in the presence of such unpredictable "allies" like Russia, which can deliver the DPRK into the hands of the imperialists a they did with Libya, as well as China that is not interested in the unification of Korea. Obviously, the current extremely dangerous situation is caused by the U.S., not by North Korea. 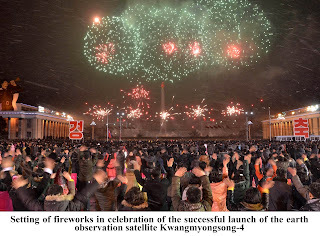 Exercises of this kind near the borders can in an instant either intentionally or because of force majeure to take the offensive, to restrain which the DPRK can only by using the nuclear armed forces that the DPRK is entitled to possess, when there is no other option to preserve the independence and sovereignty. A nation that could master the creation of nuclear weapons is essentially a "grown up" nation, which in combination with the anti-imperialist ideology will never will use it for the outbreak of war, that is something that the ruling circles of the Americans and the Russians are bound to understand. Finally I will say that in his speech Yun Byung Se noted that UN members should be more cohesive in making decisions, as if alluding to the decisive action of strangling the DPRK. The UN is not a guarantor of security and peace in the world, it is a tool of enslavement, which serves in the first place not even to any individual countries like the United States, but to the whole ruling class! 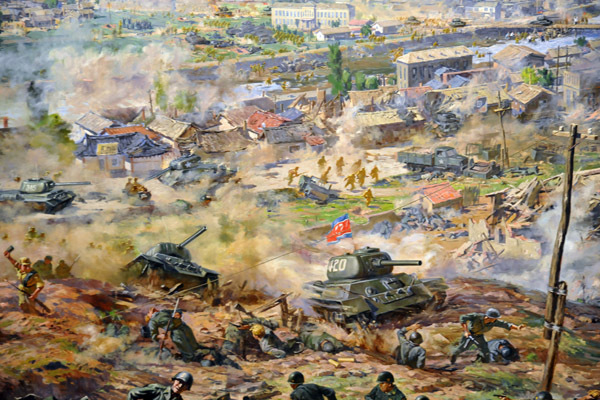 Yesterday , 20th of July , was the 66th anniversary iofthe liberation of Taejon by the Korean People's Army under the command of the great leader generalissimo KIM IL SUNG. It was in this battle that the troops of the Korean Peoples Army smashed the so-called US Army 24th division . The KPA encircled the US imperialist forces, General Dean its commander was taken prisoner by a young KPA soldier. At this stage of the war the Chinsese volunteers had not entered so this was a victory of the KPA all on its own It was a victory for the revolutionary Juche-orientated military tactics of the great leader generalissimo KIM IL SUNG. 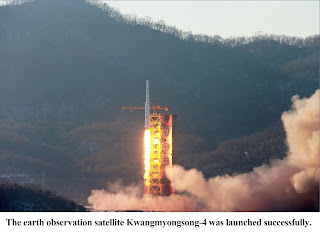 In an answer given to the Korean Central News Agency a Spokeman of the Foreign Ministry of the DPRK said " Official figures of the White House and the State and Defense Departments of the U.S. are branding the ballistic rocket firing drill conducted by the Hwasong artillery units of the Strategic Force of the KPA as "violation of resolution" of the UN Security Council and "provocation". The U.S. action reminds one of a thief crying "Stop the thief!" 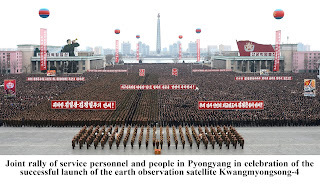 as it took issue with the routine military rehearsal of the KPA." 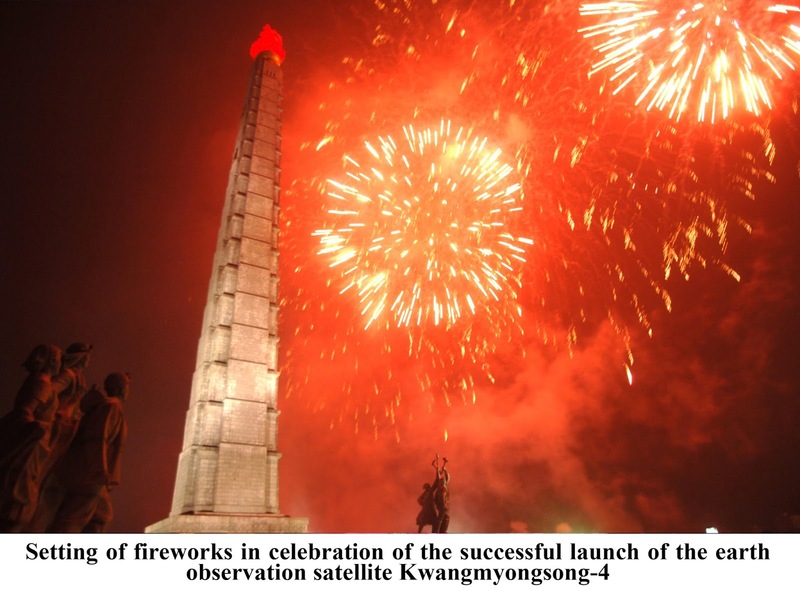 The ballistic rocket test fire of the DPRK was merely a self -defence measure of the DPRK . The US has introduced all kinds of military hardware into south Korea including nuclear weapons and is pressing ahead with the introduction of THAAD . Therefore the DPRK is fully justified in testing ballistic rockets to in order to protect its sovereignty and supreme interests . No one should take issue with this. No one should side with US imperialism against the DPRK. We fully support the DPRK's right to self-defence including nuclear and missile tests. As the statement of the Committee for the Reunification of the Country of the DPRK says " Should the puppet group ignite a nuclear war against the DPRK with the backing of the U.S. while dreaming of "achieving the unification of social systems", we will mercilessly wipe out the provocateurs through a great and just war for reunification and achieve reunification of our own style. This is our firm stand." We support this excellent and militant anti-imperialist stand of the DPRK to achieve reunification by their own style ! DPRK's nuclear deterrent does not target the UK . As a spokesman of the DPRK Foreign Ministry said in an answer to a question " It is a pity that the UK makes an excuse for the building of the nuclear submarine by finding fault with the DPRK thousands kilometers away from it. 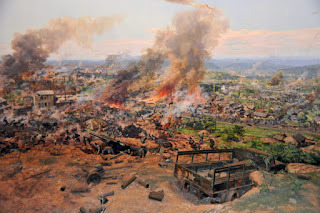 The DPRK and the UK had fought in 1950s for the latter's dispatch of troops to the Korean war but the former does not regard it an enemy as they established diplomatic relations based on mutual respect and equality. The DPRK does not regard the UK's nuclear weapons as a threat to it. 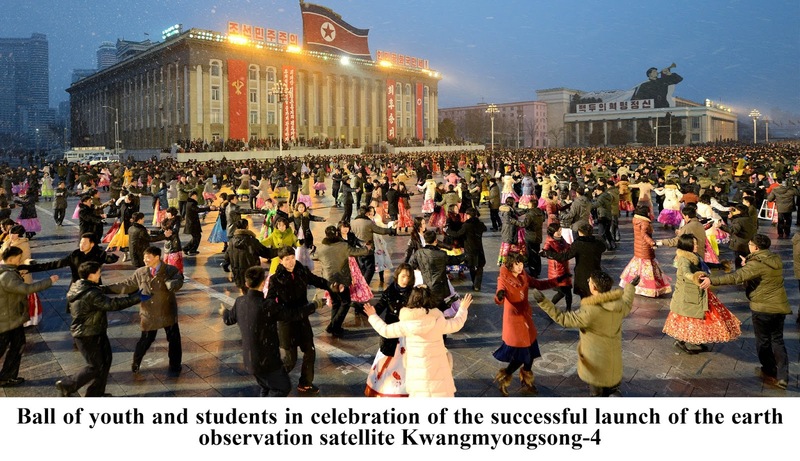 Therefore, the UK has no need to regard the DPRK's nukes as a threat to it." July 27, the day of the DPRK’s victory in the Korean War, has come round again. Human history can be also called as history of wars and there are many traces of war in the world. Many victories of war have been etched in the history of wars. 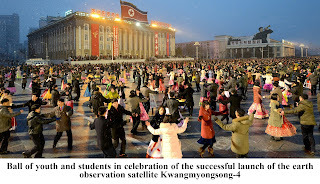 Of them, only the DPRK’s victory in the past Korean War touches the hearts of the world people through generations. 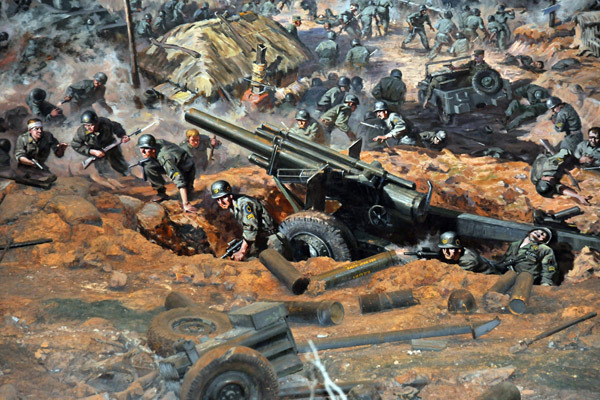 The Korean War in the 1950s was a fight between “rifle” and “A-bomb”. 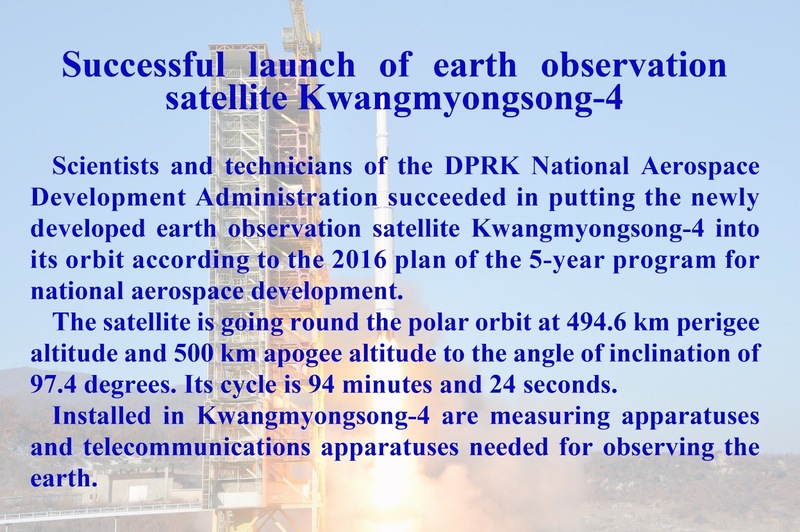 Humankind watched with bated breath the DPRK standing in confrontation with the US, who boasted of their numerical and technological superiority. 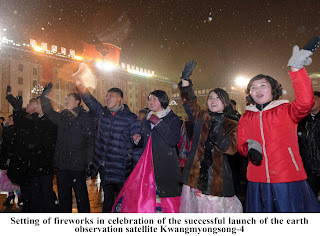 Even the world progressives felt discouraged, while pinning hope on the victory of the DPRK. 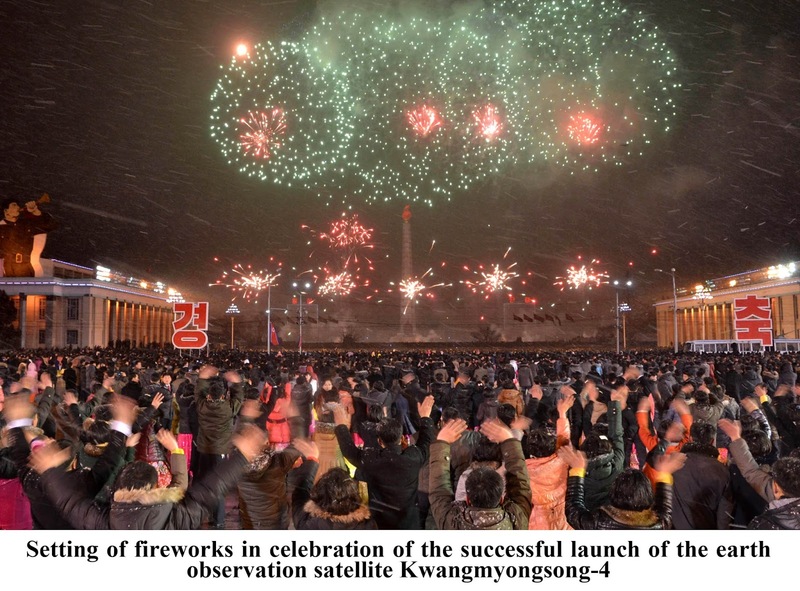 However, the world, that had experienced aggressive and predatory wars by the imperialists, witnessed the great righteous victory of the DPRK. The prominent leadership of President Kim Il Sung, the great man with few parallels in human history and ever-victorious brilliant commander, brought about an unprecedented great victory and military miracle to be recorded in the history of struggle against imperialism. President Kim Il Sung overpowered the military and technological superiority of the US by means of ideological and spiritual, strategic and tactical superiority. Through the victory of the war, the world has venerated the President as the greatest-ever commander and the erstwhile weak nation has been highlighted as heroic Korea. 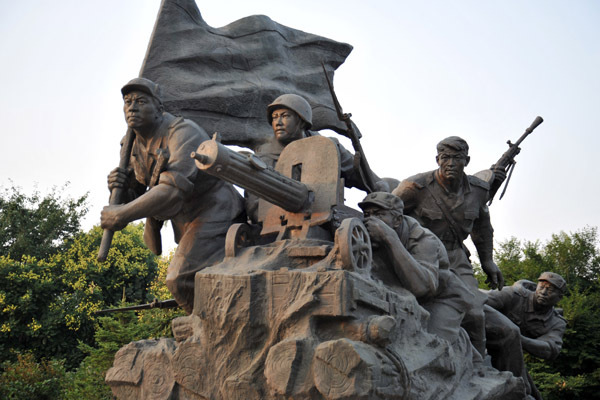 Bursting into loud shouts of “Long Live General Kim Il Sung”, the servicemen of the Korean People’s Army annihilated the enemy with redoubled courage and laid down their lives without hesitation for his security and prosperity of the fatherland. 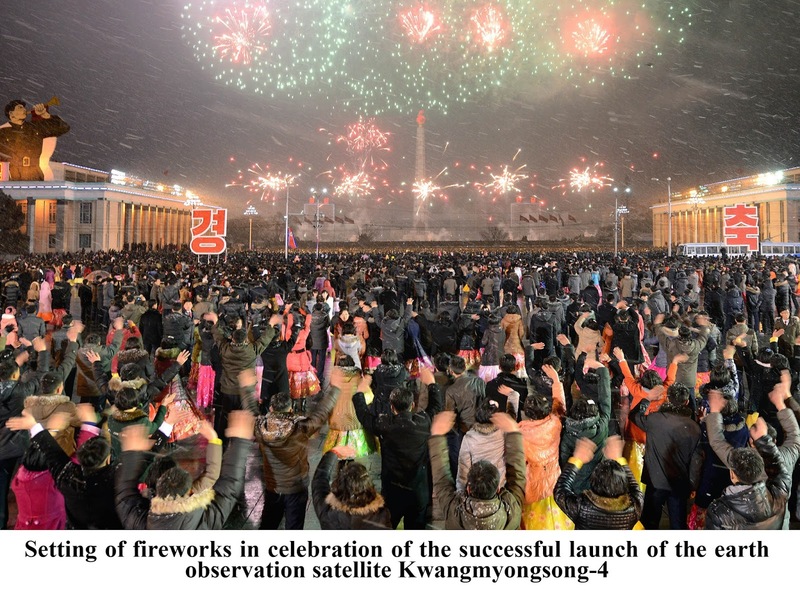 The victory achieved by the Korean people was literally attributable to brilliant victory of great ideology, faith, strategy and tactics and skilled art of command of President Kim Il Sung. 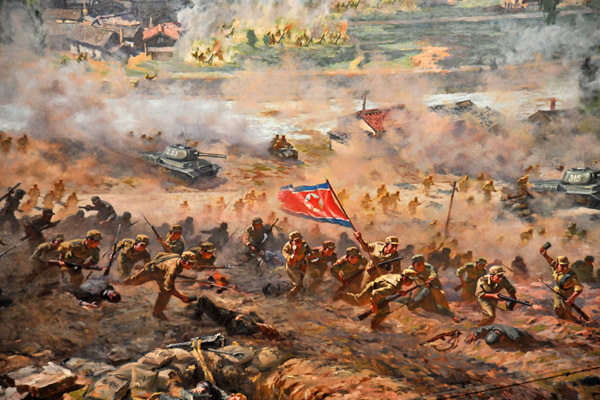 With the great victory, the Korean people saved the world from the new world war and opened up an era of new upsurge of anti-imperialist struggle by arousing the world people who were suppressed by the imperialists. Now, the Korean people and world progressives highly admire President Kim Il Sung, who brought about the second national liberation day and accomplished the immortal exploits unparalleled in world political history, as the ever-victorious brilliant commander and savior of the humankind. Although many years have elapsed since then, the wild ambition of the US to enslave the world people has in no way changed and dark clouds of war are hanging heavily over Korean Peninsula. With great national pride of revering Chairman Kim Jong Un who is identical with the President, the service personnel and the people of the heroic Korea are confident of the ultimate victory in the centuries-old confrontation against the US. It is the firm will of Chairman Kim Jong Un to put an end to the US hostile policy towards and aggressive maneuvers against the DPRK with the revolutionary armed forces bequeathed from the great leaders. Under the ever-victorious leadership of the Chairman who safeguards the Korean and world people, the victory will be the great tradition of the DPRK for good.